Audio recording studio management software provides studio owners and managers to keep their business organized. From scheduling to tracking assets, everything becomes easier and faster with these applications. 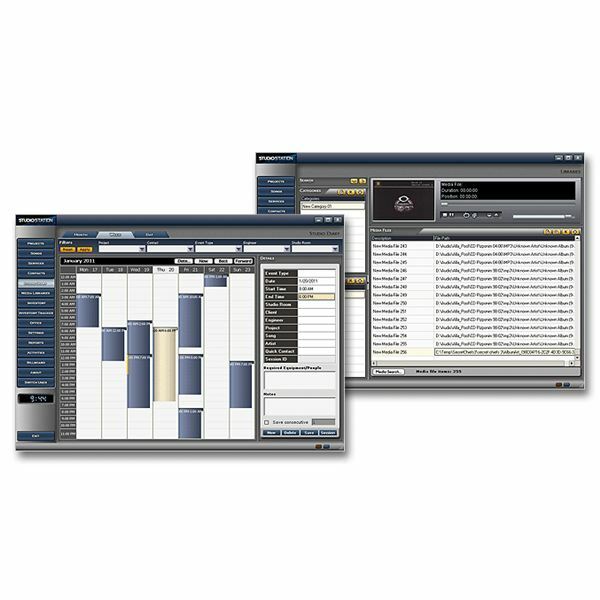 This studio management software is designed to support the high demands of active recording studios. It includes features and tools that deal with accounting, invoicing, media library management, studio services, studio projects and reports. It even has a studio diary feature that lets stuido managers keep tabs on upcoming events and sessions. Organizing different sessions by artist, project, song, engineer, room and client making this software an ideal tool for managing a high traffic studio. For smaller studios or home studios, there is a lighter version of this software that is also available from StudioFiles. StudioDix is an open source software that lets studio managers organize their studio activities in terms of performers, contacts, scheduled sessions, accounting and more. It is designed to be easy to use and with basic functionalities, so if you have a fairly manageable recording studio, this will do just fine. However, if you need more advanced features and a more powerful management tool, you can do better with other recording studio management software. Pigboat's studio management software allows you to manage your studio sessions with ease. From maintaining records of artists, songs, albums, instruments and all elements of track production, to keeping records of billing, scheduling and all information about production, this software is capable covers all that and more. Managing assets and contacts are also easy to do with this open source software, so if you have a fairly manageable recording studio, you will find that this application can do the job. This online studio management software is designed to let you manage your recording studio staff, schedule and accounting in an easy to use user interface. You can have an unlimited number of employees log in and help you manage the studio, a nice scheduling interface that makes reserving rooms for recording more efficient and a way to keep track of your finances and inventory, It can even generate reports that can help you pay your taxes faster and easier. Being an online solution, you don't have to download anything and you can even try it out for free for 30 days through the StudioHelper's Website. Studio Suite 9 is by far the most popular recording studio management software out there, and that is because it offers a full suite of features that covers everything you need to manage and organize your recording studio. There are tools to simplify the way you communicate information with your employees and clients, to make studio managements more efficient and to organize your assets and media with ease. From tracking your technology and equipment to automating tasks with your contacts list, it is all here. These five pieces of audio recording studio management software applications are designed to be used in anything from small home recording studios to large professional recording studios. They are all designed to make your life easier, giving you more time to do other tasks for your business or your personal life.